THE PEPPERIDGE FARM REMEMBERS THINGS LIKE...WHEN LIFE GIVES YOU BREAD, MAKE BREAD SANDWICHES! THEN, WHEN THE BREAD IS ON TOP, ADD THE BREADMAN! 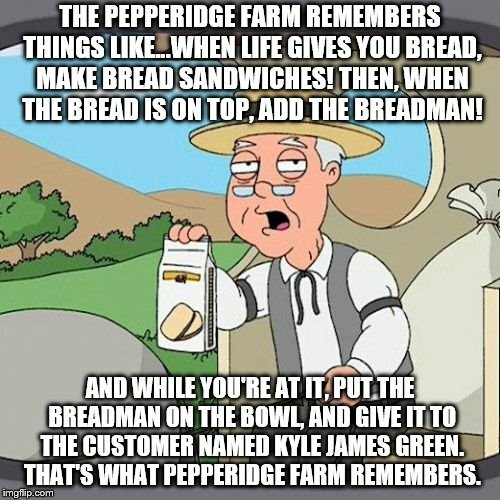 AND WHILE YOU'RE AT IT, PUT THE BREADMAN ON THE BOWL, AND GIVE IT TO THE CUSTOMER NAMED KYLE JAMES GREEN. 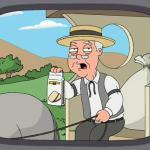 THAT'S WHAT PEPPERIDGE FARM REMEMBERS.